As people of color, African Americans are prone to skin challenges of all sorts. A scratch is not just a scratch on our skin and a breakout isn�t something to take lightly. As quiet as it's kept the majority of the "worlds" population is comprised of people of color. As obvious as this is, it's never acknowledged, therefore it�s never discussed. Approximately half the population in the U.S. will be people of color by the year 2050. You might think this is light years away but for those born in 2000 they�ll be turning 50 that year. So how will their skin be affected by the change in population and ingredients? Will companies actually formulate products that are specifically for people of color or will it be the same product with a new label. Your skin will know the difference. So ... What are some of the challenges faced by African American Skin? Hyperpigmentation � Although African Americans have a natural protection from the sun because of your increased amount of melanin, your melanin can be your greatest challenge. Melanin is what gives your skin color or pigment. Your pigments are highly susceptible to inflammation during an injury. 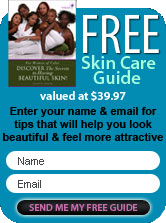 As you skin heals your skin is prone to dark spots, scars and even keloids. Even though you see skin discoloration and hyperpigmentation as one of your greatest challenges, a recent study shows that acne is the most common condition found to challenge black skin and hyperpigmentation follows second. How do you handle this challenge naturally? A great exfoliating masque, an aloe vera/cucumber peel and enough water to keep you hydrated is a great place to start. Monthly professional facials will work wonders for your skin as well. Acne - You know acne as pimples and zits on your face but what causes this to occur. Acne typically shows up when your sebaceous (sweat) glands are over active. When too much oil is produced you find yourself with oil, dirt, moisture and clogged pores. Clogged pores give birth to blackheads, whiteheads, puss bumps and all kind of unsightly growths on your face. How can you treat acne naturally? A good clay masque will help in removing excess oils and leave your skin feeling soft and subtle. Hair Bumps � Although this condition is more widely known in men skin care women do get in grown hairs. I had a man tell me that shaving with cold water diminished his challenge with ingrown hairs and razor bumps. Another man told me it was the type of razor used that caused ingrown hairs. Whatever causes them, they're no fun when they decide to pay you a visit. A simple toner can work wonders to soothe the irritation caused by razors during shaving. Enhanced with rose essential oil and your skin will heal with fewer traumas. Challenges and African American Skin, they go hand in hand. The key is in knowing how to soothe the irritations, and even out the discolorations while giving your skin the flawless complexion it was meant to have.